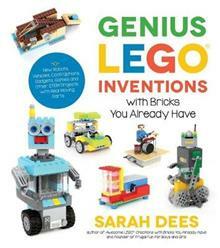 Sarah Dees' latest LEGO book hits on the popular subject that draws many kids into LEGO in the first place--tinkering, engineering, building, experimenting, solving problems and inventing. This book shares fun and exciting new science-powered creations, following the storyline of two fictional LEGO minifigure kids who are inventors. As the minifigures explore LEGO world and go on adventures, kids at home learn to build the scenes and amazing inventions step by step. The projects are fun toys that kids can play with, but they also teach the important science concepts at work behind levers, pulleys, suspension bridges, skyscrapers, gears, motorized machines, magnets and more. Kids will love that they are creating cool and unique gadgets all on their own. And parents will love that their kids are learning important science facts that help them in school, developing critical thinking skills, and, let's be honest, keeping themselves entertained for hours on end! This book makes the perfect gift any time of year for science lovers, fans of Sarah's previous books and, really, anyone who loves LEGO!